[News from News Center] At 9:00, Dec. 10th, entrusted by Qinhuangdao Party Secretary Xiangwei Meng and Mayor Ruishu Zhang, directors of departments directly under Qinhuangdao government including Education Bureau, Finance Bureau, Human Resources and Social Security Bureau and Science & Technology Bureau, led by the member of Standing Committee of the CPC Qinhuangdao Committee, Director of Organization Department and the United Front Work Department Wenping Liu and Deputy Mayor Guosheng Sun, courteously visited Academician Yongjun Tian. 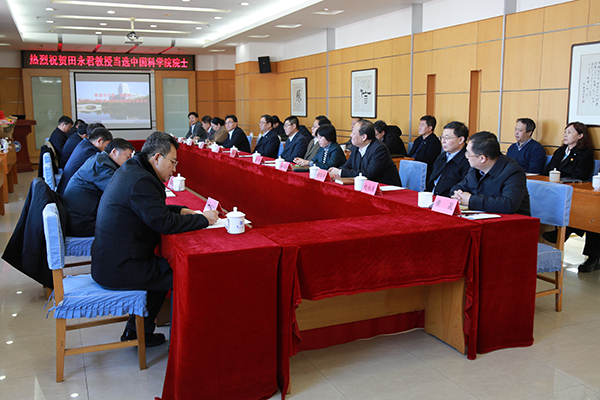 YSU Party Secretary Weidong Meng and President Hongmin Liu attended the visit as well as other YSU leaders and directors of related departments. 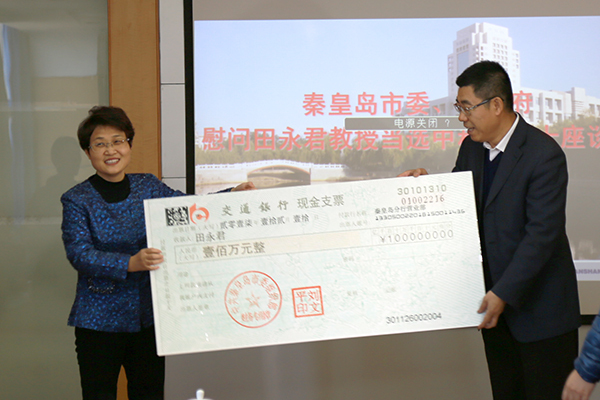 Wenping Liu, on behalf of Qinhuangdao Municipal Party Committee and Government, is awarding the bonus to Academician Tian. 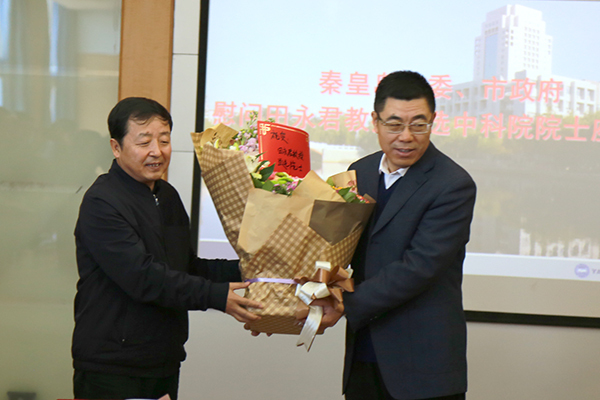 Wenping Liu and Guosheng Sun, on behalf of Qinhuangdao Municipal Party Committee and Government, delivered flowers to Academician Tian, and awarded the bonus of 1,000,000 yuan in a lump sum and living allowances of 100,000 yuan every year. They also extended warm congratulations to YSU for training out such an excellent high-end talent. Weidong Meng is delivering a speech. 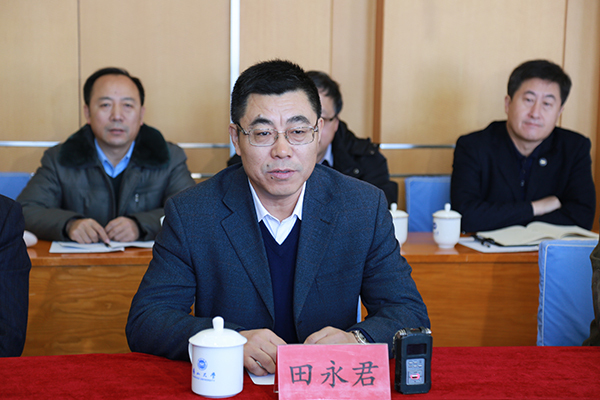 YSU Party Secretary Weidong Meng extended gratitude to Qinhuangdao Municipal Party Committee and Government for the support and care provided to YSU high-end talents for a long time. He noted that the Prof. Tian’ election as academician was a significant breakthrough of YSU in high-level talents training. Taking this event as an opportunity, YSU would continue to construct talent team and give full play to the advantages of talents to push forward the social and economic development of Qinhuangdao. Academician Yongjun Tian is delivering his speech. Tian extended gratitude to Qinhuangdao Municipal Party Committee and Government for the care, to YSU for the trust and encourage given in past years and to the faculty of School of Materials Science and Engineering for the support and help. He said that the bonus inspired him a lot and he would continue to contribute to Qinhuangdao, Hebei Province, and the country. Wenping Liu is delivering her speech. Wenping Liu, on behalf of Qinhuangdao Municipal Party Committee and Government, extended gratitude to Tian for his contribution to the science and education. 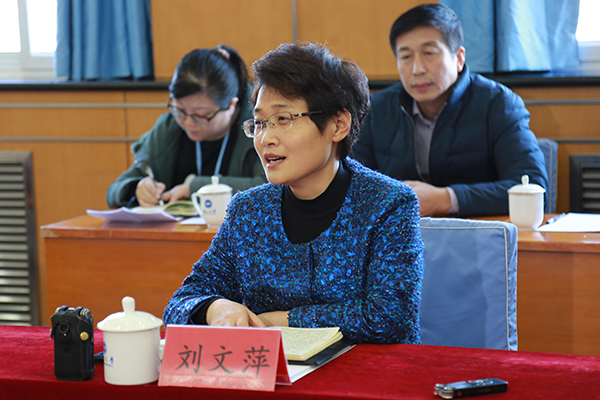 She said that the Prof. Tian’s election as academician inspired people in all circles, and was a pride not only for YSU but also for all Qinhuangdao citizens. During the key phase of Qinhuangdao realizing leapfrog development, the election injected impetus to talent work. She hoped Tian to make more achievements in scientific research, talent training and the transformation of scientific and technological achievements. 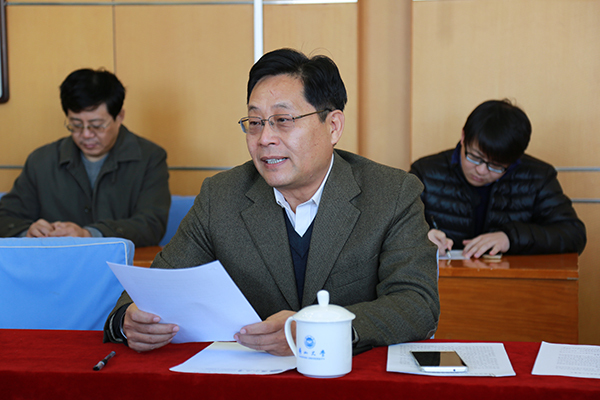 At the same time, Qinhuangdao Municipal Party Committee and Government would continue to create better conditions for Tian’s work and life and offer more support.